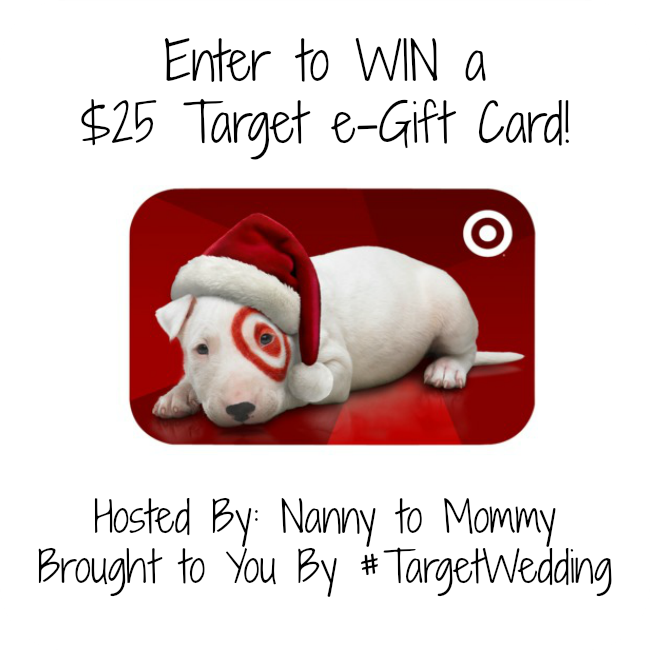 Add Some Spice to Thanksgiving with #TargetWedding + $25 e-Gift Card Giveaway! Thanksgiving is such a special occasion where family can come together and give thanks to the ones they are thankful for all year long. 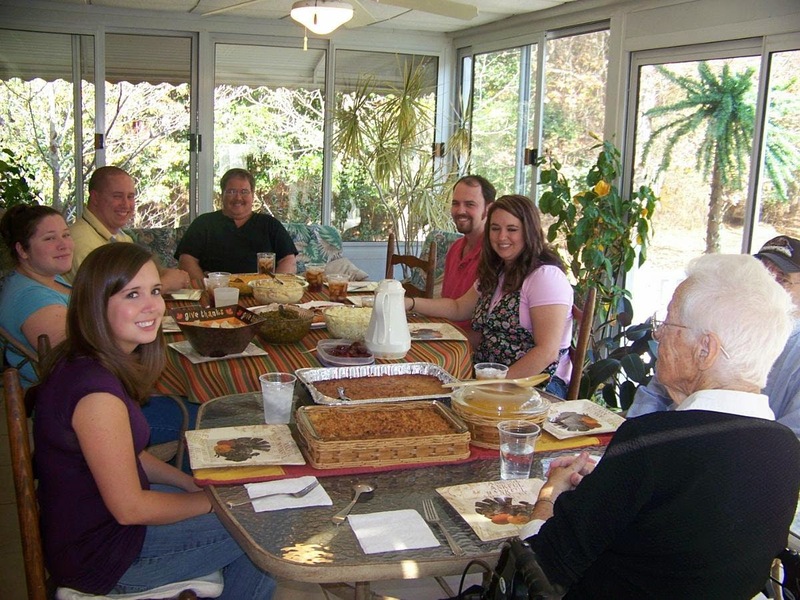 When my Hubby and I were newly weds, I wanted more than anything to host Thanksgiving at our home. But we were still moving in and didn't have a way to make that dream become a reality. I wish I had known about all that Target has to offer to make our first Thanksgiving together a truly magical one with Target Wedding Registry. 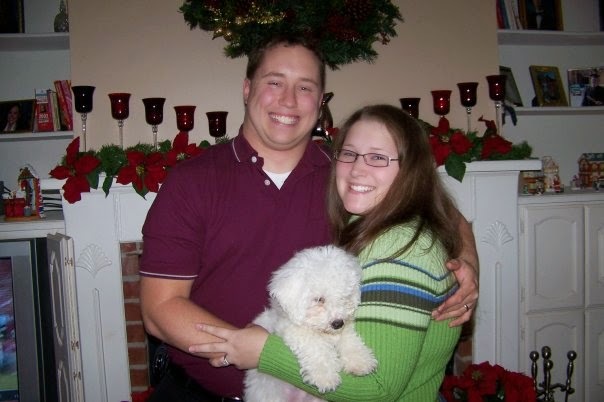 Our first Thanksgiving as newly weds in 2007. Add some spice and the Calphalon Stainless Steel Cookware to your registry so you can try a classic recipe with a twist, Green Bean Casserole with Bacon. This recipe is from eMeals and super easy. It has a that classic of her with his favorite "condiment". And of course a beautiful recipe deserves to be served just as beautifully, that's why I'm loving the Threshold Bistro Ceramic 16-Piece Dinnerware Set. To set the mood, you can stream online music from Pandora, Spotify, Napster, and more with SONOS PLAY: 5 Wireless HiFi System to heighten your meal with a little something extra. A thanksgiving to remember, I was about to "pop". 38 weeks preggo with SweetPea. Target offers so much more than the typical registry items. If you have read my review, then you know that I am loving the Keurig 2.0. Why not treat your guests to a carafe of coffee or even hot cocoa after their meal? Thank you to Target, one lucky Nanny to Mommy reader will have the opportunity to win a $25 Target e-Gift Card! Just in time for the Holidays! Entry is simple just follow the prompts on the Rafflecopter below. If you have trouble loading the form, please click HERE. This giveaway ends at 11:59 PM EST on December 10, 2014. Nanny to Mommy is not responsible for sponsors that do not fulfill their prizes. Open to US only, must be 18+ to enter. One entry per household/IP address. Although Nanny to Mommy received compensation to share this giveaway, all opinions are our own. Winner is chosen via random.org, ALL winning entries are verified. Entries are subject to change. If you have any questions about this giveaway or would like to sponsor a giveaway, please email diana.n.chastain@gmail.com. Preparing as much food and things ahead of time. My tip is to not try all new recipes on the day of the holiday. If you want to try new recipes test them in advance! My tip is to use fresh bread rather than dried bread in the stuffing. To keep the children occupied while you cook, have them do cute Thanksgiving crafts. My tip is buy a few pre-cooked dishes to help, do not try to cook EVERTHING, it really is too stressful and not necessary. My tip is to use crock pots to keep the sides warm. We try to have people who live close bring at least one dish, to cut down the amount the host has to prepare. Do as much prep work as possible ahead of time. My favorite tip is to give the turkey a brine bath of water/sugar/salt.. it makes the turkey meat less tough. My tip is always about being prepared and keeping a checklist on hand. Don't stress too much. Have family members bring side dishes, do prep work the day before, have kids help with decorations and centerpieces, and accept help with clean up. My most original Thanksgiving tip is to start days before and have movies and music going to keep everyone busy before and after the meal. I used to do it all by myself and was exhausted afterwards. I have since learned to divide and conquer. We have a beautiful table setting each year. It makes dinner that much more special! I don't have too many original tips but I scour Pinterest for new recipes. :) Found a great one for pumpkin bars which have become a favorite! Make your turkey ahead of time! It's CRAZY to try to have a turkey turn out perfectly, right on time, and make all of the other sides too. Just crazy! Make the turkey the day before, wrap it real tight in tin foil, then heat it up for a half hour or so before serving. Trust me, half the stress of the day is gone! Start chopping veggies and do as much prep work as possible a few days prior. Not that original but it has always helped me! My tip is to give something fun for the guests to take home. A cute box with a slice of pie or chocolates. They will remember it! My tip would be to not stress if something doesn't turn out exactly right. There's always other dishes available to yourself and your guests. My tip is to not stress over it, it is only a meal. Cook chicken instead of Turkey! Lot less leftovers and wasted food! Buy black olives, so your children can put them on every finger! Set everything up buffet style instead of passing the food around at the table! Always plan ahead and prep the day before. Also pull out your pots and pans a couple days before to make sure you have enough to cook with. My most original Thanksgiving tip is to not be afraid to ask for help if you need it! i make a list and plan ahead. You can make too much food so ask people to bring their favorite side dishes to reduce the work you have to do and ensure you do not end up with too many leftovers. Prepare as much as possible the day before to save on time the day of. Wrap the turkey in aluminum foil to keep it moist while baking! Do all of your chopping the day before, then all you have to do is toss it in to cook. Also, mix bread, spices, onion, and celery for stuffing at least a day before. Two is better. We make a lot of things the day before so that we can relax and spend quality time with our family. stalk up before the rush to the stores so that you have most of it at home. Cook your turkey in a countertop roaster. It's just as good as an oven roasted turkey and it frees up your oven space for all the delicious side dishes. One of my original Thanksgiving tips is to make sure between every small casserole or item that you make you clean up nicely. That way you do not have a huge pile waiting for you when everything is in the oven cooking. A little at a time makes things easier for ya! Ive learned to let people help when they ask. Theres no reason for the host to be overwhelmed managing everything. make half your stuff the day before and plan backwards from dinner!! Always try some form of semi homemade cooking to take the off. Enjoy the time with family and friends. My tip is to forego the pumpkin pie and make something more unique... like pumpkin cake! My best tip is to embrace potluck-style dinners and spread the work around! Oh my gosh original Thanksgiving tip is breathe and everything does not have to be perfect just enjoy the time with your family! Maybe this isn't so original but we have one person do the desserts, one prepare the vegetables, one prepare the starches-potatoes, one does the turkey/stuffing. My Thanksgiving Tip is for in case your running late to Thanksgiving Dinner at a relative's house: Always call ahead! Someone is bound to have forgotten something in which case you can stop somewhere & pick it up for them. They will be super happy and thankful when you show up with it! Cook as many dishes as you can the week before and freeze items that freeze well. Create a new meal and dessert each year, switch it up. Find ideas on Pinterest. Every year it's generally the same foods so add a little something new and extra each year. I dont know if this is a tip - but I like to mix it up and make a second stuffing besides the original kind. This year was a soutwestern cornbread stuffing with hot peppers - so delicious!!! clean as you go when cooking so you will have more time to spend with family after you eat. My tip is to buy some cheap food containers as everyone always wants to take leftovers home! Every Thanksgiving...I would loose all mine! So...now I stock up and have them on hand! Buy a supply of disposable plastic bowls and large plastic bags for guests to use for taking left-overs home. I am a big believer in doing everything ahead of time that is possible. The only thing I cook the day of is the turkey and bake the premade rolls! For a Thanksgiving tip, fix things ahead of time and just warm up with exception of easy things that don't take that long to make. We prepare as much of the food items that can be frozen a few days in advance so that its not so hectic on Thanksgiving Eve and Thanksgiving Day. I think relaz is a great tip...aside from that, do as much as possible beforehand would be my best! Remember that it is about spending time with the family not about the food. Split up the cooking among all who will be there. Let them each bring their family's favorite Thanksgiving food. My best tip is make lists! It helps save our sanity!! My tip is to get just the turkey breast. It cooks much quicker and if you make it right, tastes great. I didn't miss the dark meat at all this year. I love cooking holiday meals, especially Thanksgiving. A great tip is to do most of the prepwork ahead of time. It saves a lot of time and hassle! my very favorite thanksgiving tip is to let the turkey rest at least 2 hours before eating. my tip is to get most of the stuff done the night before because when people are over it's harder to do everything. I don't really have thanksgiving tips. We volunteer with our kids every year at a local community dinner. It's a great chance for them to serve and to see that others are not as fortunate. Thanks for the chance to win the target gift card! Have everyone bring their favorite dish! This works much better than having one person do all the cooking! i have never hosted thanksgiving but if i hosted it my idea would be to take things slow and prepare as much the night before and focus on spending time with your family. Prepare as much in advance, double check your list so you don't have to run out to the store last minute and ask guests to bring empty take-home dishes to be able to share the leftovers. I always have the guests bring their favorite dish and I make the main course and a few sides. It usually works out very well. My best Thanksgiving tip is to shop at the local farmer's market for the freshest and most affordable holiday produce.